"People don’t usually have problems with what you feel, they have problems with what you do. So many anger management strategies fail because all the attention is on making you change what you do: arguing, fighting, out-of-control behaviors… but to change what is happening on the outside, we need to look deeply at what is happening on the inside." "We often show a small part of ourselves to the outside world and keep the rest hidden, sometimes even from ourselves. We may act strong or intimidating on the outside, but underneath we might feel afraid of what others think about us, or terrified of failing." Understand the costs and benefits of current behavior: for example, fighting or acting tough is a way of releasing anger and feeling in control. Recognize triggers and respond in a thoughtful way instead of reacting impulsively and making the situation worse. As with the other Instant Help Books, Mindfulness for Teen Anger is designed as a workbook kids can use on their own or with a trusted adult. But I think it’s equally valuable in helping anyone who lives or works with teens to understand the fear and vulnerability that often underlie aggressive behavior. Anger management benefits are something you and your whole family will experience. Once you learn to manage your anger, you no longer have to see fear in your family member’s faces when you start to get upset. Instead, you will be able to discuss whatever you want to talk about and work toward solutions. You will have the tools necessary to successfully manage your emotions and respond to situations constructively rather than destructively. The issues can be the issues – instead of your anger taking center stage. Can you imagine what a difference this would make in your life and the lives of your loved ones? That's a great point that "the issues can be the issues"--too often the real issues get lost when we get emotionally flooded and can't calmly discuss why we're upset. 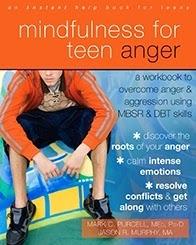 Mindfulness for Teen Anger is one of the most comprehensive approaches to adolescent anger I have found. It not only provides practical tools to help teens understand and manage their anger, but goes deeper to help them develop emotional resilience.